Posted on June 29, 2016 at 9:40 am. UTOPIES is a collaboration between Circe and Nowhere Creek, a project which continues our exploration of new world terroir, as well as our love for Shiraz. The name UTOPIES draws from the Greek derivative “ou” (meaning “no”) and “topos” (meaning “place”) and is a nice play on the location name “Nowhere Creek”. Which is literally nowhere. We could point to it on a map but that doesn’t help much. You’ve never been there. Thomas More’s famous work of fiction and political philosophy entitled “Utopia” published 1516 is a major work developing ideas on themes of unreachable places, and ideal states of being. It is suggested that More was making a double entendre with the modern pronunciation “Eutopia” being a compound word “eu-” meaning “good” and “topos” meaning “place”, hence an ideal place. This is where the word finds its beginnings in English. In contemporary English we use the word “utopia”, often ironically, as when naming satirical television shows. In contrast, in even more contemporary English we use the antonym the “dystopia”, which is where sci-fi genre filmmakers inevitably find grist for their mill. However, it turns out that the early modern English usage was actually “utopie”. So we here we have taken both states of paradise and nowhere; and bottled them. In the case of this wine the name in fact draws from the French “Les Utopies”, which are the first words of the title of the postcard graphic we have used for the label. 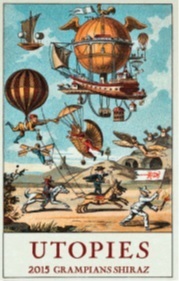 The full title “Les Utopies de la navigation aerienne au siècle dernier” translates as “The Utopias of Aerial Navigation of the last century”. The picture conveys a sense of frivolous, lifted, impossible and airborn joy which sits nicely alongside our love of aromatic, lifted wines. The image captures the spirit of whimsicality, optimism and hope which permeates the last half of the 19th century when the artwork was made. In the conception of UTOPIES we reference this period in history deliberately for several reasons. Firstly, it was a period of exploration, where the world became fully explored and cartographers finally finished the job, including Western Victoria. This was the period when exploration in winemaking in the Grampians region began, in the 1860’s. We take a moment to acknowledge Henry Best and the most generous Thomson Family, who mark their 150th anniversary making wine in the Grampians this year. Our choice of a claret shape bottle acknowledges the local tradition and preference for the claret shape. The 19th century was also an important period in Australian art, with the emergence of what came to be known as the Heidelberg School, and a new artistic depiction of Australia in more raw, sundrenched style. This marks an important point in the development of the post-colonial Australian identity, a break from Eurocentric perspective. The break away from the Eurocentric worldview represents an important cultural moment for Australian winemaking which we believe is to this day still emergent and raw in cool climate Victoria. True Australian wine styles have long existed in the Barossa Valley, Hunter Valley and Rutherglen. The new frontiers in true Australian wine styles are emerging in cooler regions. UTOPIES wine is an exploration of Australian wine flavour and style, without reference point either locally or abroad. Sadly, the rebirth of Australian fine wine since the 1980’s in cool climates has seen a return to an unrealistic reverence of all things European. And as with the modern zeitgeist, there is a disregard for good science. Current fashion sees wines which are made using practices based on philosophy rather than flavour. Paradoxically, in a search for natural and non-commercial production wines are made to a methodology – however minimalist – whichever side to ignore the obvious, critical features of both beauty and palatability. This is an oversteering which denies context. With hubris they forget where the grapes are coming from, and unless truly of Grand Cru origins, the wines largely fail to make themselves. Consumers are being asked to swallow stories, however unpalatable the wines may be. Our current working definition of Grand Cru in Australia draws from an historical view of oenology. Looking at Europe, Grand Cru vineyards have been classified based on quality of wine, longevity, exceptional character and charm. Historically, this must all been viewed in the context of little or no oenological science. So we see that these vineyards produce wines which have all the technical attributes in perfect order, requiring no intervention of acidity, ripeness, sugar, tannin or microbiology. The wines do indeed make themselves. The local fashionistas overlook this and, whilst quirky, their wines are frequently angular, pokey or just plain wrong. I object. We do not claim that Nowhere Creek is Grand Cru. After all, this is the first iteration of grape growing on this land, with this variety. We routinely need to correct the grape acidity by adding tartaric acid. This ensures colour and microbial stability, increases the length of palate and improves the efficacy of sulphur dioxide, allowing us to minimise this second additive. So in the bottle we have Shiraz grapes, Viognier grapes, tartaric acid and sulphur dioxide. We also use cultured yeasts to ensure complete primary fermentation. It is true that wine is the natural product of grape decomposition, but unfortunately Brettanomyces and acetic acid bacteria are also natural and taste disgusting. So we strive to make the wine as best reflects the grapes and their origins. Of course, in any oenological adventure it would be silly to ignore the history from France. The 19th century wines made from Côte Rotie would have been made in a very similar fashion to this UTOPIES Shiraz – without destemming, with a small inclusion of viognier, foot stomping and ageing in large oak barrels of 500L and 600L. Larger oak barrels from a cooper in the Rhône Valley have been specifically purchased. These are the traditional demi-muid format of 600L with thick staves which reduce the level of oxygen transfer through the oak. They are beautifully crafted and quite expensive but will last a long, long time, ultimately reducing our assault on the forests. Having a larger volume to surface area also reduces the oak flavour pickup and keeps the wine in a very compact, reductive environment. As a consequence for this first release we have not needed to rack or fine the wine to manipulate the tannins. All this picks up from where I left off my work at Mount Langi Ghiran, unencumbered by house style considerations in a first draft under a new label. As always we are chasing aroma, balance and finesse and our winemaking seeks to express these elements without concern for power, weight or impact. Making a wine from nowhere, we are at once liberated from any historical or geographical reference, and at the same time bound to both our senses and the context of a uniquely Australian place – landscapes, skies, vines, sunlight, water, rocks. UTOPIES is a vinous impression of place and season, a vinous snapshot from nowhere.